(Almost) 100 years of Lewis structures: are they still fit for purpose? The name given to the molecule by the chemists who made it reflects the ligand used, which we can represent as cis-HS-CH=CH-SH (via its di-sodium salt and reaction with VCl3). Its entry in the Cambridge crystal database is NAMPOG (which carries only the slightest of semantic or structural information). The chemical name however does carry some further information, namely the designation tris implies three fold symmetry (D3h in this case), and hence that all three ligands are in fact identical (structurally). A nominal first stab at a Lewis electron pair representation reflecting this symmetry might be as shown above. At this point we hit a logical problem with the final component of the assigned name; the formal oxidation state of the metal is designated IV. However, three moles of (-)S-CH=CH-S(-) imply the ligands carry a formal charge of 6-, and that therefore the metal must be 6+, or VI. Six however is not an oxidation state normally exhibited by vanadium. Why did the original discoverers designate it IV? Well, because careful electron counting reveals the system as a whole has 161 electrons, of which 71 are designated as valence electrons, and hence it must have one unpaired valence electron. 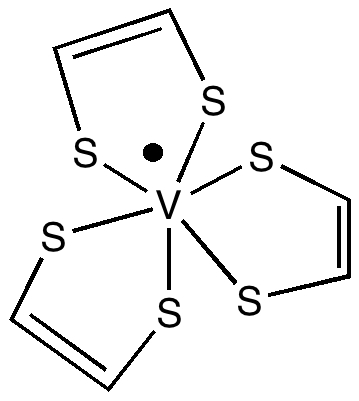 In the representation above, that electron is shown resident on the V atom with a dot, and the ESR spectrum measured for the molecule turns out to be apparently characteristic of V(IV) systems (they do not mention whether they also compared the spectra with those derived from genuine examples of V(II), see below). This implies (as the authors note) that a total of only 4- must be delocalized over the three dithiolene ligands. 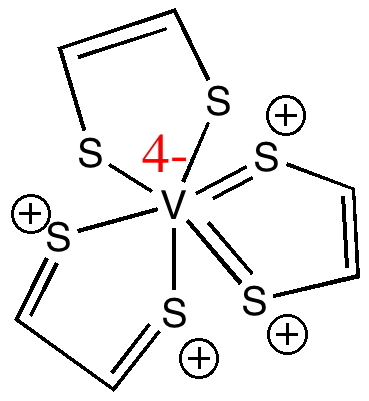 Returning to our electron counting, of the remaining 70 valence electrons, 24 electrons are implicit above as twelve sulfur lone pairs (which are sometimes shown as double dots, but their explicit inclusion here would cause clutter) and so we presume the remaining 46 electrons must be in Lewis-like electron pair bonds. Well, the structure above implies 24 such bonds (the six C-H lines, as well as the Hs are also omitted by convention, again to avoid clutter!). We can begin to see why the original article lacks a Lewis structure, since the one above contains too many electrons (48 rather than 46). How might one proceed to rescue the situation? Because a great many possible Lewis structures could be drawn, we have to learn a little more about the molecule and seek recourse in the bond lengths measured for the system. The most obvious is the C-C length, which turns out to be 1.36Å, a value significantly longer than expected for a C=C double (i.e. a four electron) bond, but a little shorter than the 3-electron bond found in e.g. benzene. The Lewis structure (one of three equivalent ones) now has 5 lines in the C-C region, or ~3.3 electrons per C-C bond averaged over three ligands, which seems to match the length a little better. It also has 25 lines representing nominal electron pairs and ten sulfur lone pairs, a total of 70 electrons. 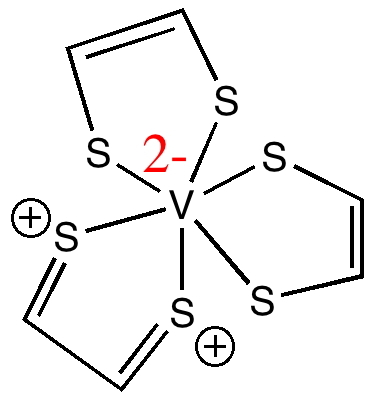 The net effect of this representation is to transfer two electrons from the sulfur lone pairs to the vanadium, and hence to reduce the formal charge at the metal from 6+ to 4+, or to V(IV). This sort of behaviour, where electrons can be borrowed from a ligand and used to reduce (or oxidise) the metal they are coordinated to is called non-innocent behaviour. The dithiolene ligand is notoriously non-innocent. It results in this case in our innocent assumptions that bonds are defined by an integer number of electrons [2,(3),4,(5) or 6 as in Lewis’ original classifications] are no longer adequate, and that non-integer descriptors must also be used. There is still one counting rule we have not inspected. To complete its valence shell to reach Kr, V needs 18 valence electrons. The representation above gives it 13. So how about the following, which ends up with a valence shell of 17 electrons for vanadium (and an oxidation state of V(II))? This implies that the V-S bonds might be a little shorter than normal. Well in NAMPOG its 2.35Å, perhaps slightly shorter than a typical V-S single bond of ~2.4Å, but in fact we are now down at the noise level, and its clear that we have probably reached (if not exceeded) the limit of semantic interpretation of the Lewis model. In this case, only three (of 100s of possible) Lewis structures have been discussed, and of course they were selected only because we had some experimental information to discriminate between them. And we must be aware that whilst Lewis structures are the simplest way of analysing the electron distribution in a molecule, far more sophisticated analyses are nowadays possible. The real question is which analysis can actually result in a greater insight into the molecule? But the least that can be said about molecule NAMPOG is that it causes one to think about the problems of representing bonding (I will draw the line however at using this example in my university admissions interviews!). 1 I thank J. P. P. (Jimmy) Stewart for drawing this molecule on my blackboard and hence provoking this blog post. This entry was posted on Monday, September 27th, 2010 at 3:16 pm and is filed under Interesting chemistry. You can follow any responses to this entry through the RSS 2.0 feed. You can leave a response, or trackback from your own site. I would take a slightly differing point fo view regarding Lewis Dot Structures. Your presentation comes from the perspective of why is it so difficult to get the Lewis structure for this compound, with the underlying precept being that this appears to be an exception or outlier to Lewis theory. I teach lewis dot structures form the perspective that they really have no reason to ever work – being totally non-QM in nature! So that means we are glad when it does provide some insight and not surprised or confused when it fails. This molecule is simply way beyond what simple Lewis notions can handle. In response to Steve, Frank Weinhold’s NBO (Natural bond orbitals) do seem to provide an avenue to quantum mechanical interpretation for Lewis structures. To quote Weinhold’s own description: “These methods lead to a mathematically rigorous “Lewis structure” representation of the wavefunction, with associated bonds, hybrids, and other valence descriptors determined in optimal fashion.” Furthermore, the interaction energy between a Lewis-like electron pair and an acceptor NBO orbital provides a further link to some aspects of the arrow pushing that is often associated with Lewis structures. Where the problem arises is that one might have an over-abundance of Lewis structures to choose from, and the simple approach may provide no help in choosing the best. 3 C-C σ, 6 C-S σ, 6 C-H σ, 6 V-S σ, 6 S σ-lone pair, summing to 27. No surprises here so far. Then; 2 S=C π, 2 C=C π and 4 V=S π, summing to 8, giving a total of 35. That actually corresponds to one Lewis structure that I did not draw, and which would (formally) correspond to an oxidation state of V(0). It also appears to give the V a 20-electron valence shell. In fact however, NBO reports partial occupancies, and so this number is certainly lower. I think it might also be worth giving NBO 5.0 a whirl, since it might localise more efficiently. I think in fact Lewis structures may have a deeper origin to them than we have previously considered. I mentioned in the previous comment that using the cation of the molecule produced a closed shell, and a rather easier NBO analysis. Another way of creating a closed shell would be the anion. Does it come up with the same picture? Well, no. The 72 electrons find themselves in 27 Lewis bonds, and 9 lone pairs on S. Six of these lone pairs can be described as σ and three as π, accompanied by three C=C π and three V=S π. This fills the V valence shells to Kr, i.e. 18, and produces an oxidation state of V(V). Ostensibly, quite a persuasive solution. I have just found a very interesting summary of how Lewis structures match with Quantum mechanical wavefunctions. See DOI: 10.1021/jo801407e by Dmitry Zubarev and Alex Boldyrev. It takes the NBO approach and extends it to delocalised structures.